A couple of months ago, the creative minds of AZIndia team finally sat down to give definite shape to a lingering idea that for some time had been doing the rounds from one mind to another gaining on size and volume. Next, scriptwriter, to videographer, to announcer, to designer to scores of innumerable behind-the-scene participants or in other words log saath aate gaye, karwaan badhta gaya. Then what could have been the best time but the occasion of their monthly tabloid, AZIndiatimes’ second jubilee, when that abstract idea which had by then metamorphosed into an audio-visual capsule, aptly titled Diorama, had its maiden public presentation, first in the theaters and then embedded online on YouTube a fortnight later. 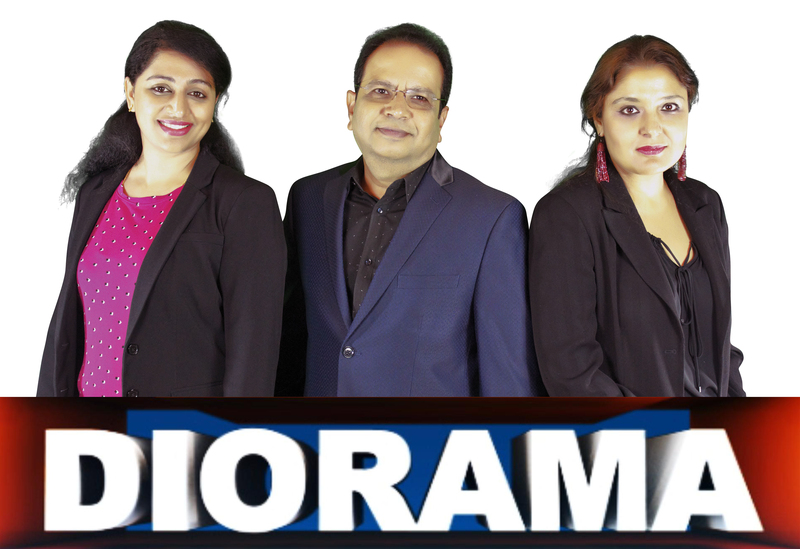 As the name suggests, Diorama is a three segment video clip which begins with a glanceback on the momentous events and happenings in and around the town, reviews and videocasts public opinions on FDFS of much awaited Bollywood flicks. Parichay, the second segment of Diorama, introduces an achiever, who is one among us, and narrates their success story in their own words. Third and final segment is an overview of the upcoming must-attend community programs chronicled with a dash of humor known as Event Wale Babu. The face of Diorama is a three member posse of presenters - Aanchal the Anchor, Sneha the Surveyor, and Babu Bhai the Bespectacled Briefer. If the names sound familiar then you are not mistaken, they are AZIndiatimes’ much acclaimed writers and contributors better known as Aanchal Sethi, Sneha Ranebennur and Babu Raman (of Tasty Affair fame) respectively. After its much talked about maiden show on July 1, Diorama will be showcasing its second installment on August 1. You can watch it on the big screens at your nearest theaters during intervals and in case you do not frequent movie theaters as often then the YouTube version (search for azindiatv) is made available by the second week of every month. And yes, while at azindiatv do have a dekko at our 27-second clip of Dhadak stars congratulating AZIndiatimes (Another first of its kind). Keep checking the site for more such videos. Diorama, a gift from the house of AZIndia, is a sincere attempt to connect with all members of the Indian Diaspora in Phoenix in an unbroken bond of warmth and goodwill. Do watch Diorama and all your reactions - approval or censure, feed backs, new proposals, what is missing, tips - in short anything, is welcome.